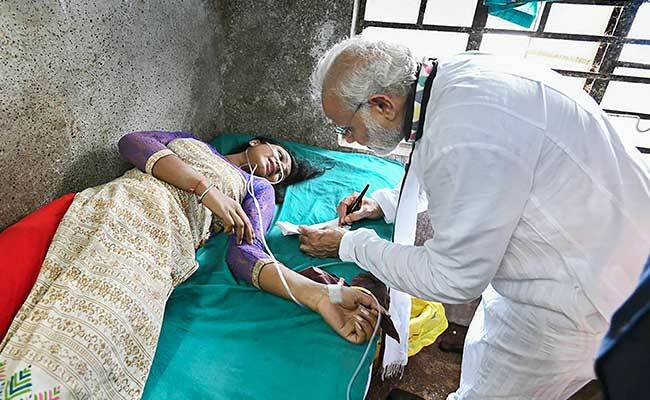 PM Narendra Modi visited the injured in hospital after a canopy collapsed while he was addressing a rally at West Bengal's Midnapore. 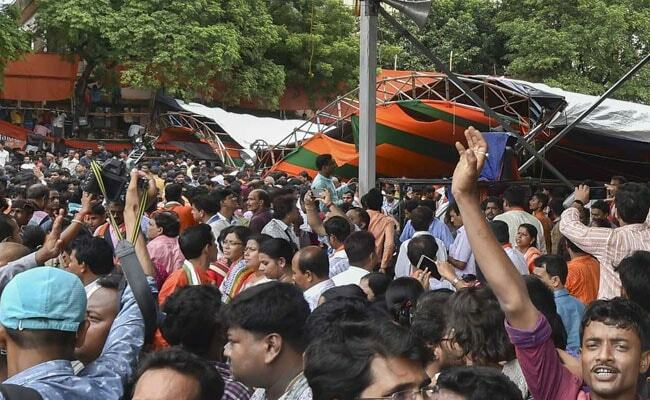 Around 90 people were injured today at Prime Minister Narendra Modi's rally in West Bengal as a marquee collapsed on a section of the crowd in the middle of his speech. PM Modi appeared emotional when he visited the injured in hospital, reported news agency ANI. The canvas, iron and wood structure was put up as protection from the rain at the rally in Midnapore. As a portion of the huge tent started collapsing, PM Modi stopped his speech to urge people to be safe and ordered his security personnel to take care of those injured. "Those who have climbed up, please get down, all of you....please climb down. Those standing up there, please get down. Don't run," PM Modi appealed. The injured were taken to hospital on motorcycles and on an ambulance that follows the PM's convoy. The Prime Minister's doctor, Special Protection Group personnel and BJP workers were seen carrying hurt men and women to cars. By late evening, most people with minor injuries were released. Two remained in critical condition. The centre sought a report from the West Bengal government on the collapse of the structure. The BJP's IT cell in-charge Amit Malviya tweeted that an injured woman at the Midnapore hospital asked the PM for an autograph, and he obliged. Union minister SS Ahluwalia, one of two BJP parliamentarians in Bengal, denied any mismanagement and said the tent collapsed under its own weight. "There were so many enthusiastic people," he said. It had been raining heavily since morning - which had turned the ground soggy, the BJP said - and there was a persistent drizzle when the tent collapsed in the afternoon. The shaky structure was weakened further as people tried to climb the supporting poles for a glimpse of the prime Minister. Officials called the incident a major security lapse and questioned whether the event and its venue were cleared for the PM after a government structural engineer's approval. "Over Rs 350 crore is spent each year on the PM's security and if the venue of the most protected person is not structurally secured...," an official said.